Greta Van Fleet was honored with a Grammy Award for Best Rock Album in the pre-telecast ceremony at the 61st annual ceremony in Los Angeles on February 10. The Michigan outfit’s 2017 EP, “From The Fires”, took top prize over projects by fellow nominees Alice In Chains (“Rainier Fog”), Fall Out Boy (“Mania”), Ghost (“Prequelle”) and Weezer (“Pacific Daydream”). Issued in November of 2017, “From The Fires” mixes four songs from the band’s debut EP, “Black Smoke Rising”, with four new recordings; the set earned the group their first US Top 40 chart placement when it peaked at No. 36 on the Billboard 200. 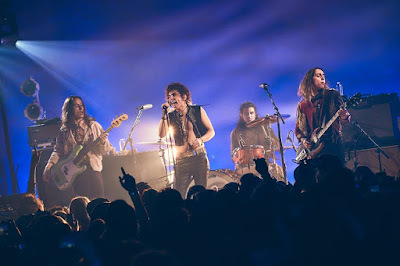 Leading the 2019 field of rockers with four nominations, Greta Van Fleet were shut out in the categories of Best New Artist, Best Rock Performance and Best Rock Song. The band released their full-length album debut, “Anthem of The Peaceful Army”, last fall, with the set going on to enter the Billboard 200 at No. 3. Greta Van Fleet recently cancelled a series of dates on their Australian tour on doctor’s orders after singer Josh Kiszka came down with laryngitis.